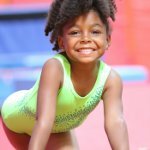 Open Gym at Pacific West Gymnastics gives your child an extra chance to work on their skills or just come in and burn off some energy with their friends in the gym. Open Gym is open to anyone, so bring your friends and let them know what Pacific West Gymnastics is all about! Preschool & Grade School Open Gyms are also available at Union City. Visit our Gymnastics Open Gym page for details.